Ooo look. at. the. custard. look! 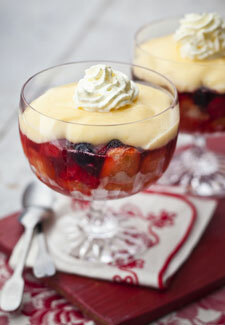 Keep your relatives happy this Easter with a tipsy trifle. It needs to be baked for 1 hour, enough time for an Easter egg hunt! 1. To make the trifle, preheat the oven to fan oven 140C/gas 3. Tip the raspberries over the base of a large deep, ovenproof dish. Press down lightly with the back of a spoon to release some of the berry juices. 2. Cover the raspberries with the slices of cake, then spoon over the Drambuie and orange juice. Leave to soak for 10 minutes. 3. Whisk together 600ml of the double cream with the eggs, sugar, orange zest and vanilla extract or essence. Spread the jam over the sponge to cover completely then slowly pour on the custard mixture. 4. Sit the dish in a roasting tin with enough hot water to come at least 5cm up the sides. Bake for 1 hour. The custard should be just set with a little wobble left in it. Leave to cool then cover with cling film for an hour in the fridge. 5. To serve, whip the remaining cream until it just holds its shape, then spoon it over the custard and and a swirl of cream on to each serving.